The structure in this photo can be found at Dazaifu Tenmangu, sort of off to the side of the main plazas, amongst the small mini-shrines on the edge of where the main grounds meet the forest. It struck me as interesting, strange, and yet familiar. Somehow it reminds me maybe of a stupa or a part of the top of a pagoda, but those are Buddhist symbols, and would be strange to find at such a prominent Shinto shrine, no? It's been almost exactly a year now since I was there, and in all that time it's never come to me what this is. I apologize to just come and show such a picture without making it look like I've done any research, but... with only a picture and no search terms to start from, it's quite difficult to do such research. Besides, it could spur good conversation here. Somehow it reminds me maybe of a stupa or a part of the top of a pagoda, but those are Buddhist symbols, and would be strange to find at such a prominent Shinto shrine, no? It's very common to find Buddhist and Shinto symbols intermixed-for most of Japan's history, they've been intertwined, with many temples housing shrines. 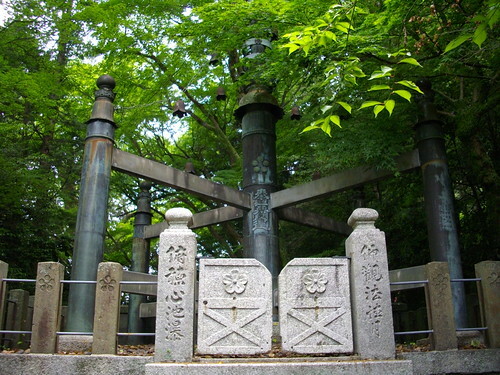 It wasn't until the Meiji period that the government attempted to split them apart (since Buddhism had come to be seen as as agent of the old Shogunate and Shinto was advanced as the symbol of the Emperor). It strikes me as just plain odd. Meiji period or later? It reminds me of things from around the 19th to 20th centuries. Lots of bronze and what looks like concrete. The mon used appears to be the symbol of the city itself, so possibly a monument of some kind, but I don't know that it is particularly Shinto or Buddhist. I think I can see what you mean, though. The top has the "parasols," as I've come to think of them, that adorn the tops of Buddhist stupas or pagodas. The tops of the pillars could represent peaches or jewels, but I just don't know. No, I was fully aware of the intertwining of Buddhist and Shinto symbols historically... such as one very frequently finds at small Shinto shrines on the grounds of major Buddhist temples. But I've never seen a pagoda or a daibutsu or any large-scale major Buddhist symbol like that at a majorly important Shinto shrine. Now that I'm at home and can see the photo (blocked at work), I really don't see it being any type of Buddhist symbol (or in the style of one). I believe Josh's guess of it being a monument might be correct. The posts and beams look somewhat like the skeleton of some kind of building, though missing four posts. Is that possibly what you are thinking of? I think it's the crashed remains of Blake's ship, the Liberator. Wow, never saw anything like that before. Very cool.